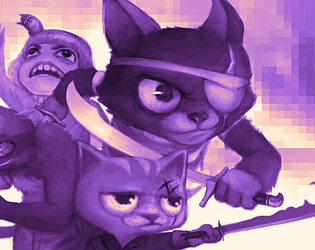 Help the pirate cats defend their hard earned booty! Fun, but without 360 camera control (by right mouse hold) it feels very fixed. Also the characters animations are abysmally slow and ineffectual feeling. But the art is great! Very fun game! The camera felt a little claustrophobic, since it was so close to the player and couldn't move up/down. It was a little hard to understand to destroy the spaceship, but a great game! Loved the art too, and the music was AMAZING! The art style and music fitted together really well and the game play was fun. Having control of the camera would have made it a bit easier to look around everywhere rather than being in one position. The idea is nice and the realization is good but I've not been able to do anything other than running from the alien. Did I missed something? I love the characters, music, and artwork! I'm not sure what to do after the cat lady says "They're taking it, after them!" and there's the green light ray on the chest. Nothing seems to happen to the chest and no more enemies come. Any hints? Nice job! The art was great. I think the melee was a little unreliable; it was hard to tell if we were in range. A lot of time I would just slam into the enemy and click my mouse hoping they'd drop a health pack. Cute style, good music, and an interesting idea. Well done! EDIT: As pointed out, I think the camera was a little close. Maybe just letting us zoom in/out would help a bunch! Really great work! The art was really well down and the environment was well put together. The camera was a bit close to my liking but really well done guys!